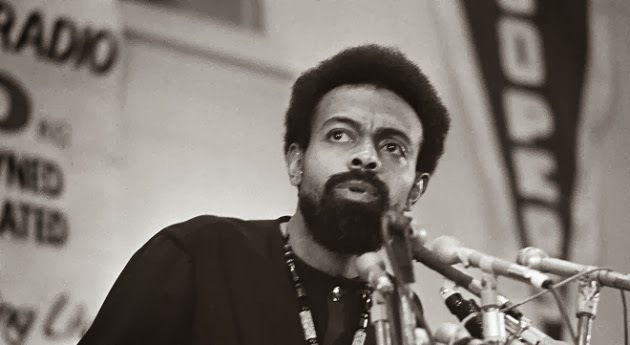 (AP) -- Amiri Baraka, the militant man of letters and tireless agitator whose blues-based, fist-shaking poems, plays and criticism made him a provocative and groundbreaking force in American culture, has died. He was 79. He was as eclectic as he was prolific: His influences ranged from Ray Bradbury and Mao Zedong to Ginsberg and John Coltrane. Baraka wrote poems, short stories, novels, essays, plays, musical and cultural criticism and jazz operas. His 1963 book “Blues People” has been called the first major history of black music to be written by an African-American. A line from his poem “Black People!” — “Up against the wall mother f—–” — became a counterculture slogan for everyone from student protesters to the rock band Jefferson Airplane. A 2002 poem he wrote alleging that some Israelis had advance knowledge of the Sept. 11 attacks led to widespread outrage. Categories: Amiri Baraka, Now This is Black History, R.I.P.